Thailand is famous for its incredible beaches, and no holiday in Thailand is complete without at least a few days beside the sea. However, instead of rushing straight down to the islands, it can be a lot more rewarding to first spend a few days getting to know the nation’s capital. Although Bangkok might be best known for its gridlocked traffic and huge shopping malls, it’s also home to some of Asia’s most magnificent temples, excellent nightlife and a huge range of world class restaurants. We’ve put together a one week travel itinerary that gives you the best of both worlds: three days of big city life in the bustling metropolis of Bangkok, followed by four nights relaxing beside the beach in Phuket, Koh Samui or any of southern Thailand’s other best beach destinations. Are you in Thailand for more than one week? If you’d like to extend your stay in Bangkok and see more of the city, read our One Week in Bangkok itinerary. 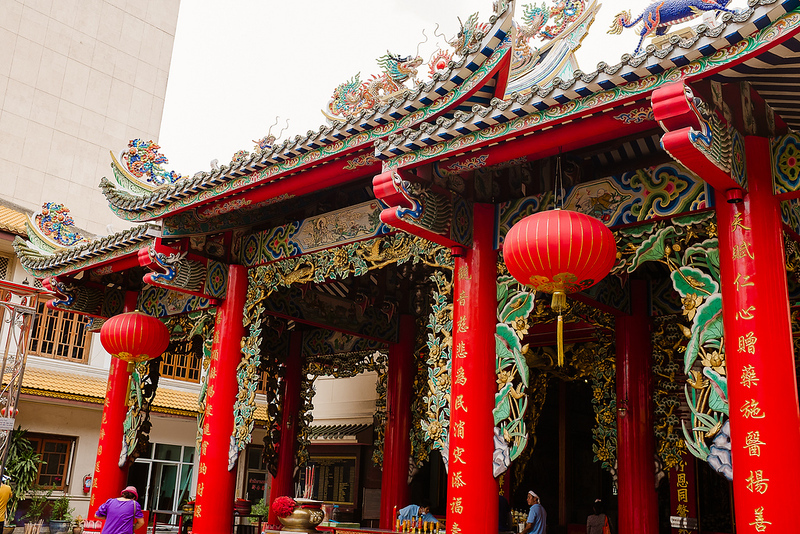 Bangkok’s Old City is packed with incredible temples and historical sites. Dress in conservative clothes that cover your shoulders and knees and make sure to wear closed shoes, as many of the city’s temples have a relatively strict dress code. Larger temples and tourist attractions, such as the Grand Palace, have clothes for rent at the gate for visitors that aren’t dressed appropriately. The Grand Palace is a huge complex of stunning temples and historical buildings, including Wat Phra Kaew (Temple of the Emerald Buddha), which houses a 66cm emerald Buddha statue that was reportedly discovered in 1434 in Thailand’s far north. Other attractions inside the 218,400 square metre grounds include the Chakri Maha Prasat hall and a large selection of public buildings. The Grand Palace is open from 8:30 am until 3:30 pm daily, with a 500 baht entry fee for non-Thai citizens. Located within walking distance of the Grand Palace, Wat Pho is a stunning Buddhist temple that contains a 160 foot statue of the reclining Buddha. In addition to the Buddha statue, Wat Pho contains a historically significant massage school that’s open to guests. Wat Arun, also known as the Temple of Dawn, is located across the Chao Phraya River from the Grand Palace and Wat Pho. This 17th century temple offers fantastic views over the river and Bangkok’s Old City and can be access from Tha Tien Pier using the cross-river ferry. Feeling hungry? After you’ve finished viewing Rattanakosin’s historical temples, pop into Sala Rattanakosin — an upmarket boutique hotel next to the Chao Phraya — for lunch. The hotel’s restaurant is open until 4:30 pm for lunch and is also a great place to visit for dinner. The Deck is another riverside restaurant that’s conveniently located close to many of Bangkok’s most popular historical attractions. More affordable than Sala Rattanakosin, The Deck serves a variety of Thai dishes and a good selection of cocktails. Feeling like something a little more local? Thip Samai Pad Thai is a famous Pad Thai restaurant that’s been open since the early 1940s. Open every evening for Pad Thai, the restaurant is one of only a few in Bangkok that cooks old-fashioned Pad Thai over an open charcoal fire. Although Bangkok isn’t as much of a shopping hub as Hong Kong or Singapore, it’s home to an immense selection of shopping malls that are a great escape from the relentless sun and heat of the city itself. Bangkok’s most popular area is Ratchaprasong, which contains several of the largest shopping malls in Asia. Most of the malls contain inexpensive food courts, which are typically found in the basement or on higher floors. Arguably Bangkok’s most popular mall, Siam Paragon is connected to BTS Siam and attracts a large crowd of local residents, students and tourists. The lower floors of the mall house luxury brands, while the upper floors sell electronic gadgets and high street fashion. Siam Paragon also contains SEA Life Bangkok Ocean World — an aquarium — and a cinema complex on the upper floors. Siam Centre and Siam Discovery, its two neighbours, are great places to shop for teen and early-20s fashion, outdoor clothing and home accessories. Mahboonkrong, better known as the MBK Centre, is a large shopping mall next to BTS National Stadium that contains hundred of small shops. The MBK Centre is best known for its food court and huge selection of mobile phones, tablets and other electronic gadgets. Central World is Bangkok’s biggest shopping mall. Located halfway between BTS Siam and Chit Lom, it has more of a middle class focus than the other malls in the area, offering a wide range of high street fashion brands, electronic gadgets and household goods. An extremely upmarket luxury mall, Central Embassy is where Bangkok’s high society comes to shop. While the lower floors house luxury boutiques, the upper floors have a great selection of international restaurants, cafes and eateries. Designed and built in the late 1950s by silk industry entrepreneur Jim Thompson, this house is an excellent escape from Ratchaprasong’s huge shopping malls. 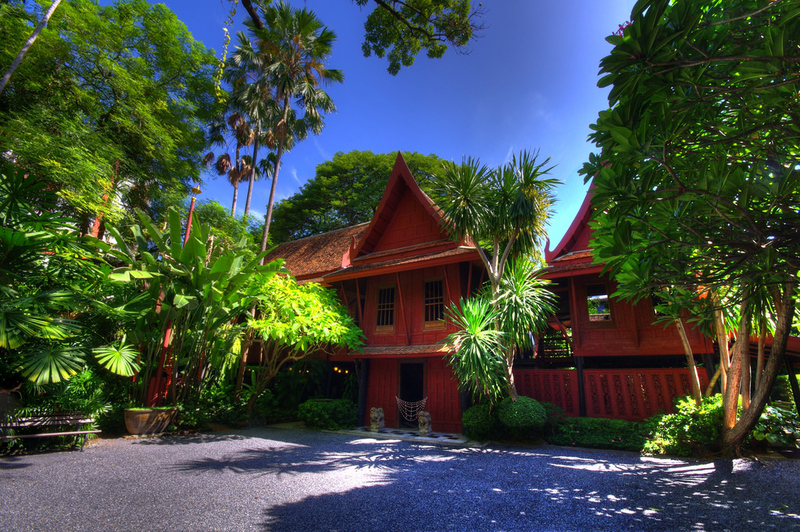 Decorated in a traditional Thai style, the home was Mr Thompson’s residence until he disappeared in Malaya in the late 1960s. A shrine to the Hindu god Brahma (referred to in Thai Buddhism as Phra Phrom), the Erawan Shrine is a popular shrine and tourist attraction located a short walk from Central World. Most visitors stop by from 7 to 8 am or 7 to 8 pm to make a wish at the statue. Exploring Bangkok by night is a unique experience, providing a great look at the city’s markets and temples without the usual heat, traffic or crowds. The Bangkok Night Bike Tour passes by Wat Arun, Wat Pho and a flower market starting from shortly before sunset. Thonburi, the quieter side of Bangkok located across the Chao Phraya River, has an immense network of klongs that once served as Bangkok’s primary method of transportation. The Small Teak Boat Canal Adventure tours Thonburi’s klongs and provides a unique look of what life in Bangkok is like outside the busy streets of the city centre. Bangkok is famous for its street food, and the city is full of great places to enjoy it. Chinatown — which is located along Yaowarat Road — and Silom Soi 20 are both home to street food markets with a good selection of stalls cooking up fresh Thai and Chinese dishes. Asiatique The Riverfront is a large outdoor shopping mall with over 1,500 stalls open from 5 pm, located beside the Chao Phraya River. 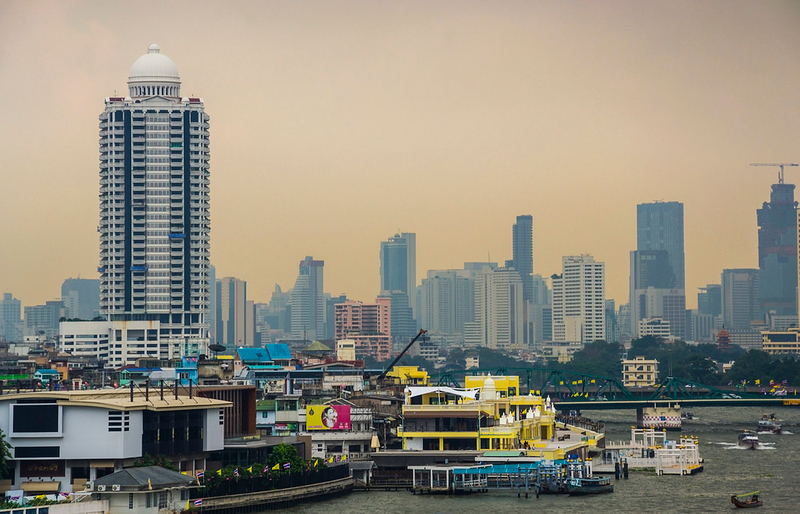 A great place to shop for souvenirs, the bazaar also has a selection of cabaret shows and a Ferris wheel offering views over the Chao Phraya River. Read on for full details about each beach destination and to choose the one that’s best for you. Travel Time: Three hours from Bangkok by bus or taxi. A quiet and peaceful resort city located just three hours from Bangkok by car, Hua Hin is one of Thailand’s most accessible beach destinations. 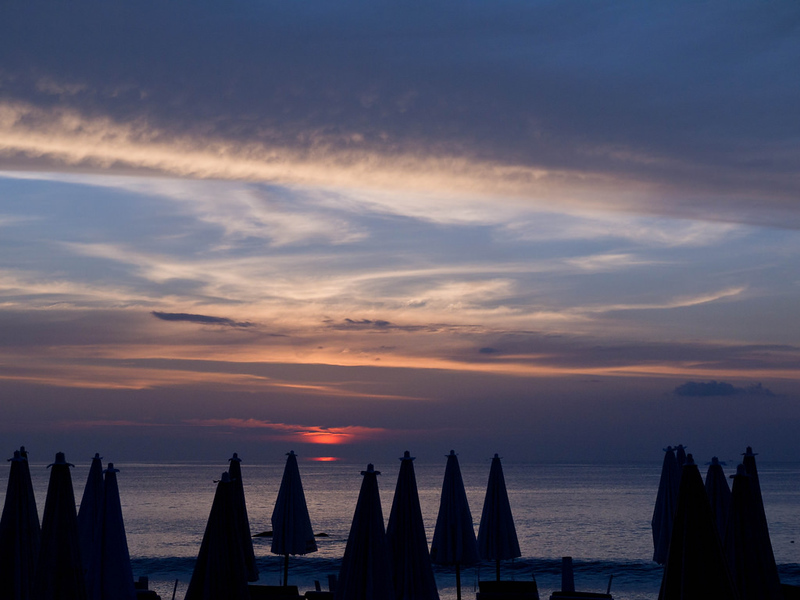 Large beachside hotels and a quiet atmosphere make Hua Hin a good destination for families. Although Hua Hin’s beach isn’t as stunning as those found further south in Phuket or Krabi, its clean water and slow-paced way of life make Hua Hin a nice relaxation destination after a few days in Bangkok. In addition to its charming beach, the area around Hua Hin has several golf courses, temples and other attractions within easy reach. Sam Roi Yot National Park, famous for its limestone rock formations and wildlife, is an additional attraction less than an hour from Hua Hin. 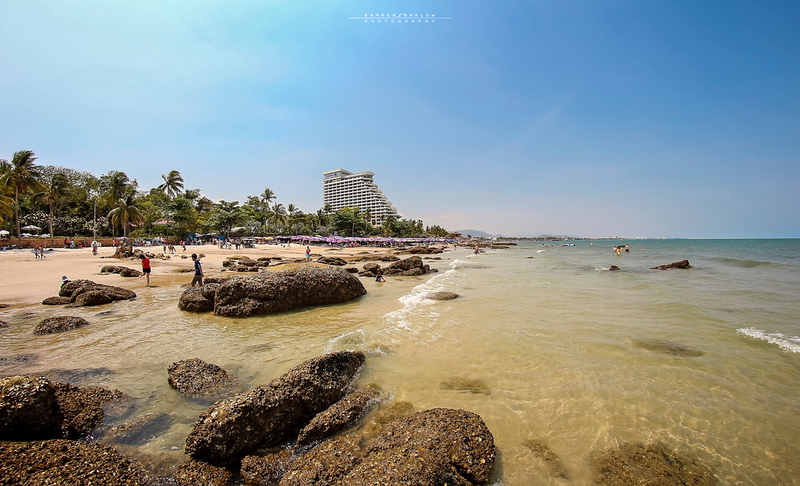 Although Pattaya is better known for its seedy nightlife than its beaches, there are some nice beaches a short distance from the city that make Pattaya a convenient choice for people that only have a few days to spend in Thailand. Koh Larn, which is easy to access from Pattaya, is a small island with several crowded yet nice beaches that are easy to reach from Bangkok. 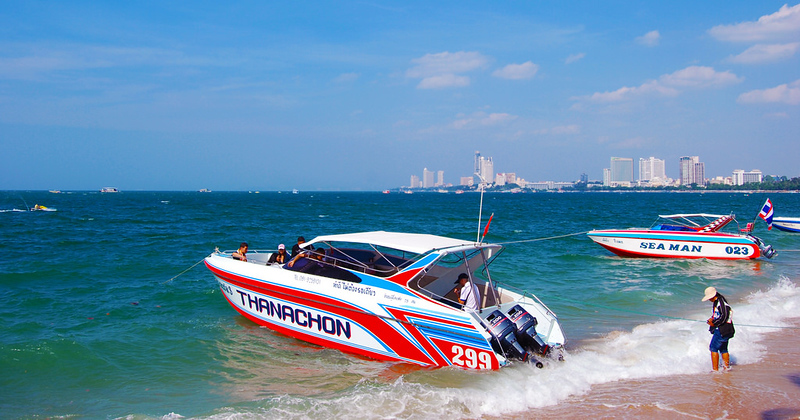 Naklua, located to the north of Pattaya, offers a pleasant beach and several well-known seafood restaurants. Although Pattaya’s beaches aren’t spectacular, the city has a huge range of upmarket hotels with great views over the Gulf of Thailand. Pack your swimsuit, but if you’re unwilling to travel outside the city to Chonburi’s nice beaches, it’s probably best to stick with the hotel pool. Recommended for: Solo travellers and couples, provided nightlife is avoided. 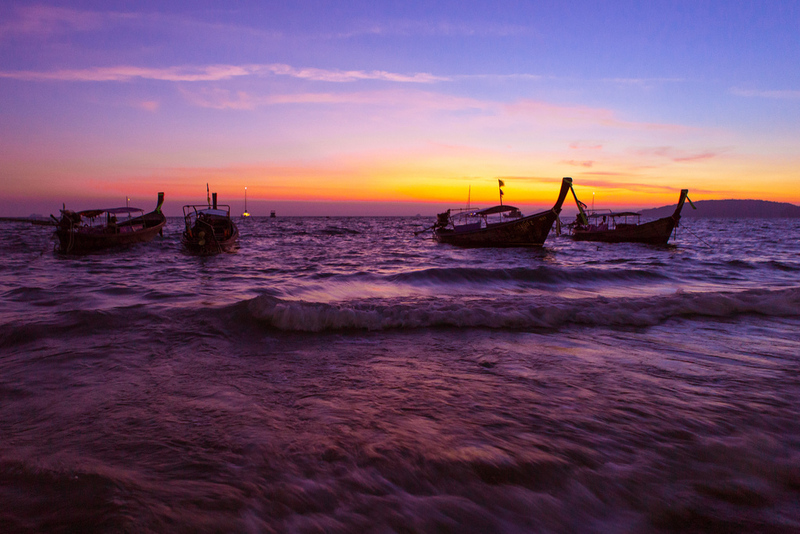 Nearby: Ban Phe, where the ferry departs for Koh Samet, is less than one hour from Pattaya. 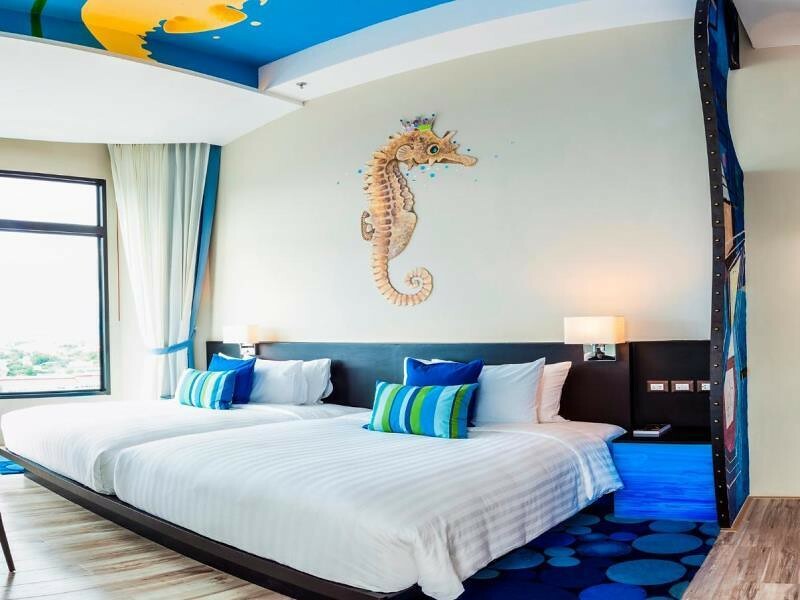 Pattaya’s latest luxury hotel, the Hilton Hotel Pattaya is an extremely luxurious hotel located on top of the Central Festival shopping mall. With great sea views and a selection of restaurants, the Hilton is arguably the nicest hotel in town. Less expensive than Pattaya’s growing selection of five-star hotels but still clean, upmarket and luxurious, Siam @ Siam Design Hotel is a unique hotel with two rooftop swimming pools and a selection of modern rooms and suites. 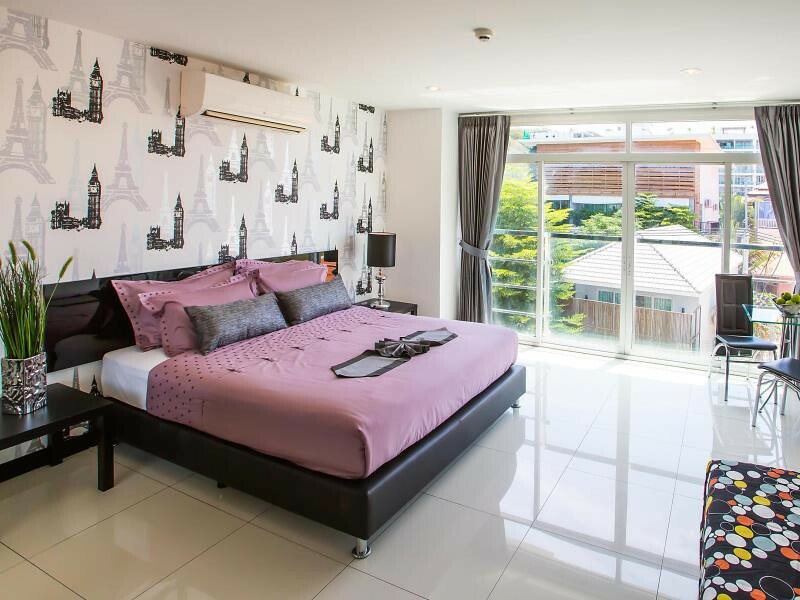 Located halfway between quieter Jomtien Beach and Pattaya, South Beach Pattaya Apartment is a modern, inexpensive apartment hotel with a convenient location and a selection of spacious apartments. One of Thailand’s easiest islands to access, Koh Samet is just three hours from Bangkok by bus or taxi. Smaller and less developed than Koh Samui or Phuket, Koh Samet is a great destination that can easily keep visitors occupied for two to three nights. There are several great beaches on Koh Samet, most of which are found on the eastern side of the island. As a popular weekend destination for residents of Bangkok, Koh Samet is busier on the weekend than the week, making it best to visit from Monday to Friday for peace and quiet. Nearby: Koh Samet is a short distance from Pattaya and Rayong. Koh Samet’s only resort with a private beach, Paradee Resort is made up of 40 luxurious pool villas, many of which are located right on the beach. By far Koh Samet’s most luxurious resort, with prices to match. Located on Koh Samet’s most popular beach, Sai Kaew Beach Resort has a large selection of comfortable bungalows. The resort is a short walk from Sai Kaew Beach’s top restaurants and bars, making the rooms close to the beach a little noisy on weekends. 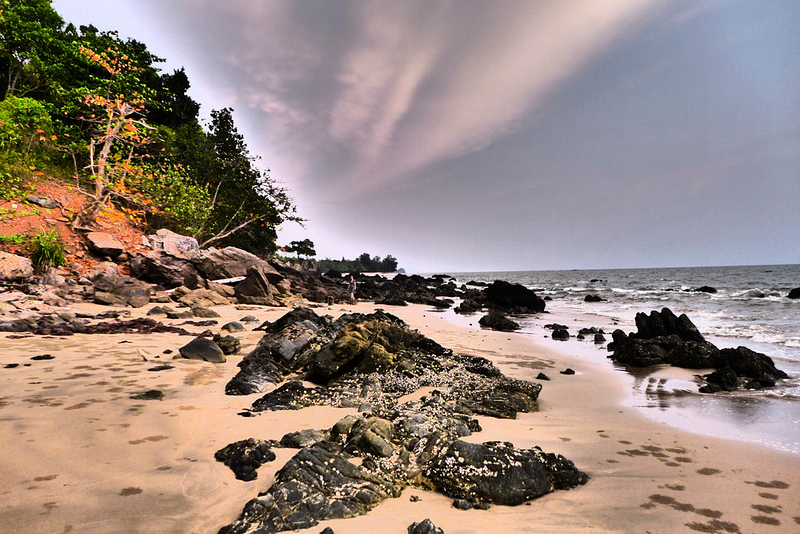 A short walk south from Sai Kaew Beach, Tubtim Beach is a quieter area aimed at couples and families. 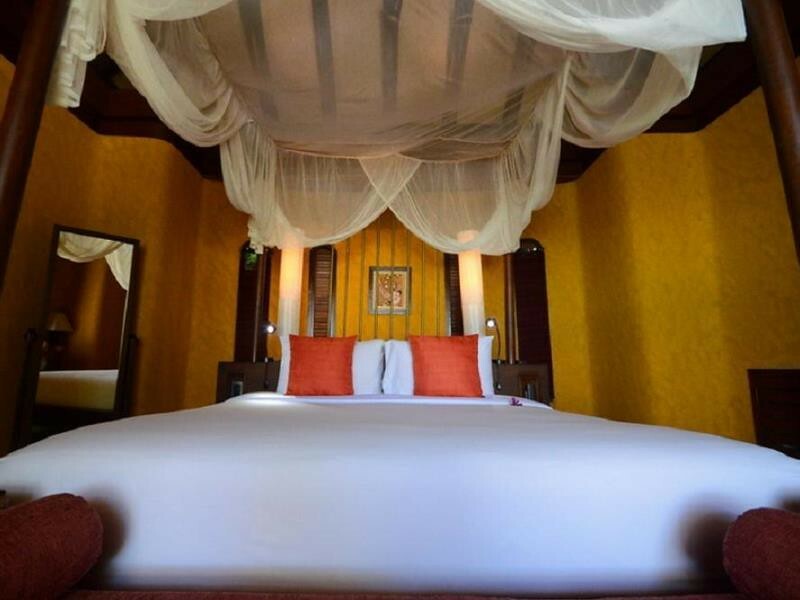 Tubtim Resort has a large selection of bungalows, ranging from cheap fan rooms to a small group of air conditioned bungalows located just a few metres from the beach. 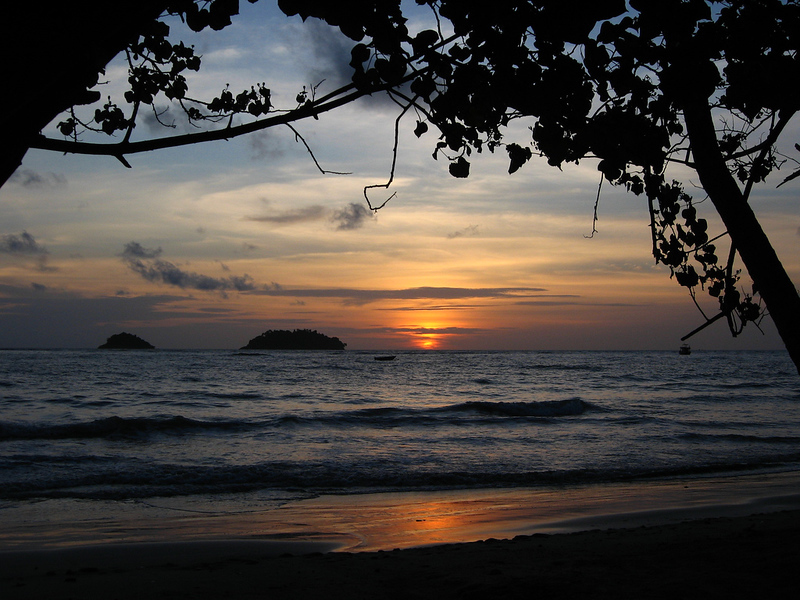 One of Thailand’s largest islands, Koh Chang is located five hours from Bangkok by bus. Much less developed than Phuket or Koh Samui, Koh Chang has a good mix of luxurious hotels and cheap backpacker accommodation. Quiet, uncrowded beaches and a great range of things to do make Koh Chang a fantastic island for couples, families and solo travellers alike. Most of Koh Chang’s beaches are located on the western side of the island, with a few secluded bays and beaches found further south. Although large hotels and commercial areas are popping up around Koh Chang, the island still has a much quieter feel than Phuket or Koh Samui, making it a good choice for visitors seeking a mix of convenience and natural beauty. Recommended for: Couples, families and backpackers. Stay for: Four nights or longer. A modern five-star hotel with beautiful grounds, The Emerald Cove Koh Chang Hotel is one of the island’s most luxurious hotels. The hotel offers romantic beachfront dining, making it a good choice for couples. Koh Chang’s Klong Prao Beach is one of the island’s best, located between the popular White Sands Beach in the north and busy backpacker hub Lonely Beach. Koh Chang Paradise Resort is located right on the beach and offers a great selection of bungalows and pool villas. Pajamas Koh Chang Hostel is a low-cost backpacker hostel with great facilities located close to the popular Klong Prao Beach. Rooms are clean, modern and simple with an outdoor swimming pool near the beach. 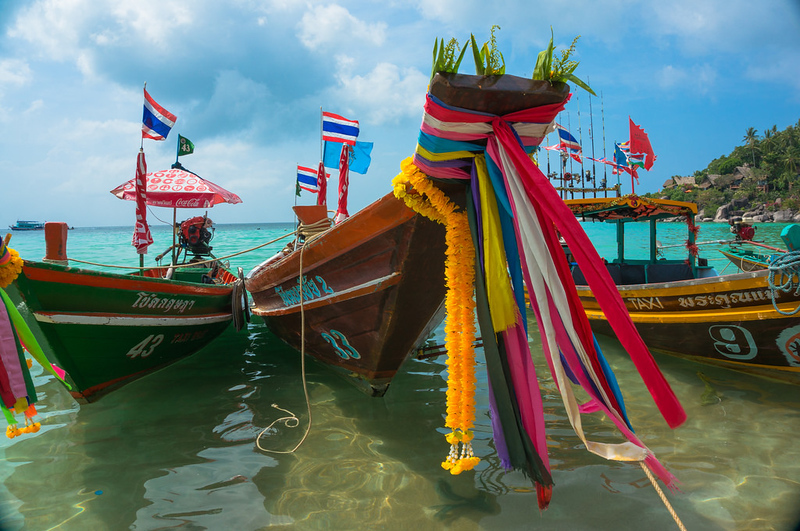 Thailand’s largest and busiest island, Phuket has been a major travel destination for several decades. By far the most heavily developed island in Thailand, Phuket has a great range of hotels and tourist attractions suitable for families, couples and backpackers alike. Although Phuket is massively popular and many of its major beaches are very crowded, it’s still possible to find pockets of peace and quiet. Travellers willing to drive to the island’s less popular beaches will be rewarded with some of the most beautiful stretches of sand in Thailand. Thanks to its large airport, Phuket is easy to access from Bangkok. Flights depart several times daily, connecting the capital with the island in under an hour. Most destinations in Phuket are at least 30 minutes from the airport by taxi or minivan. While the large crowds of package tourists that flock to Phuket’s west coast beaches may put many people off visiting, this island’s combination of fun tourist attractions, travel convenience and variety make it a good all-round destination. Stay for: From three to four nights to the entire week, depending on your trip duration. 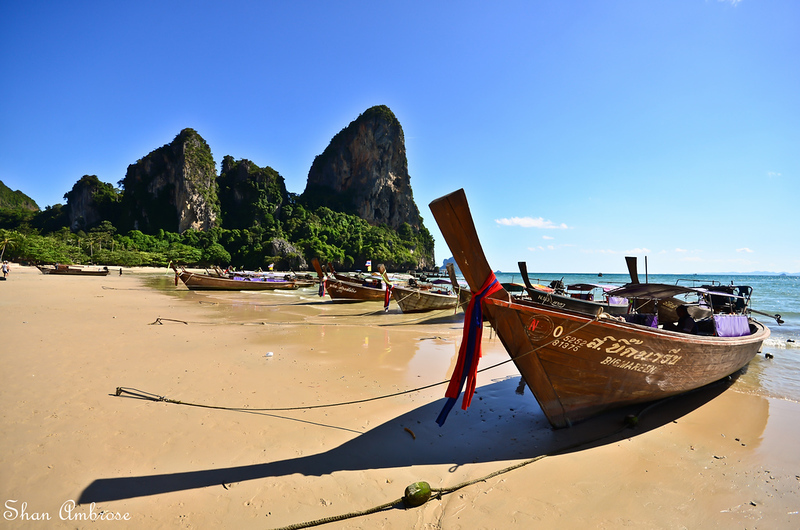 Nearby: Krabi and Koh Phi Phi are a short ferry trip from Phuket. Located far from the maddening noise of Patong and package tourists of Kata and Karon, the Renaissance Phuket Resort and Spa is a five-star resort on Mai Khao Beach that’s perfect for couples seeking a quiet, romantic getaway. With a great location overlooking Kata Beach, the Sugar Palm Grand Hillside Hotel is a classy four-star hotel with a great selection of rooms. The hotel’s swimming pools, which are set on several levels overlooking the sea, are directly accessible from many of its guest rooms. Another Kata Beach option, Kata Beach Homestay and Backpacker is a budget guesthouse in one of Phuket’s most popular areas. 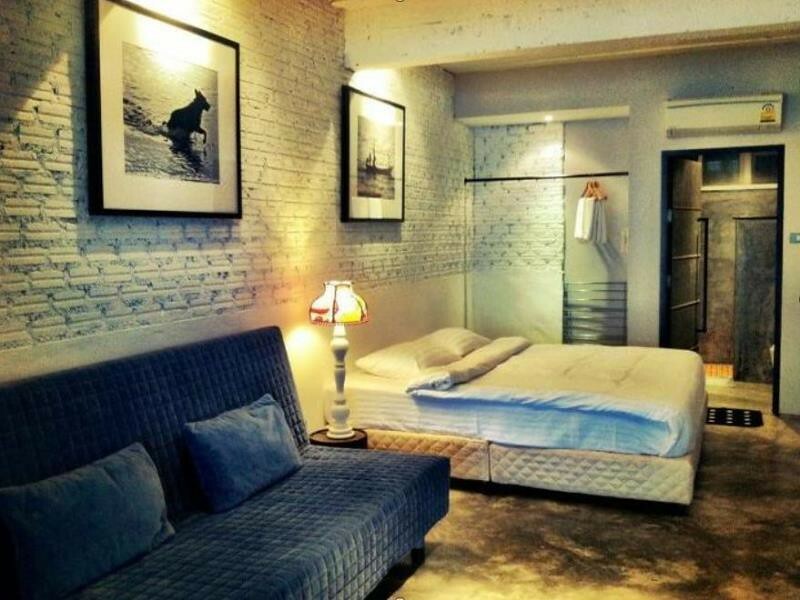 The guesthouse is a short walk from Kata’s most popular bars and restaurants, as well as Kata Beach itself. Although it’s only a short distance from Phuket, Koh Yao couldn’t be more different. This group of two islands — the largely undeveloped Koh Yao Yai and more popular Koh Yao Noi — offer incredible views over Phang Nga Bay and its limestone karsts. 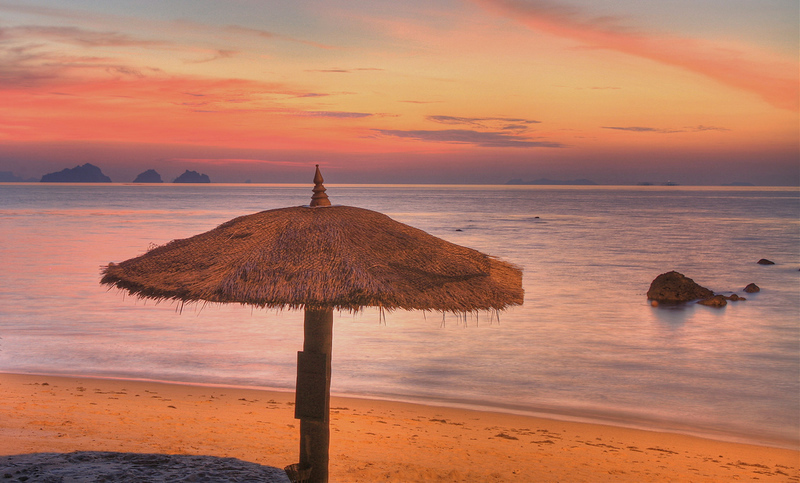 Accommodation on Koh Yao ranges from inexpensive bungalows to some of Thailand’s most expensive resorts. The island’s isolation and beautiful sea views make it a great destination for couples seeking peace and quiet. 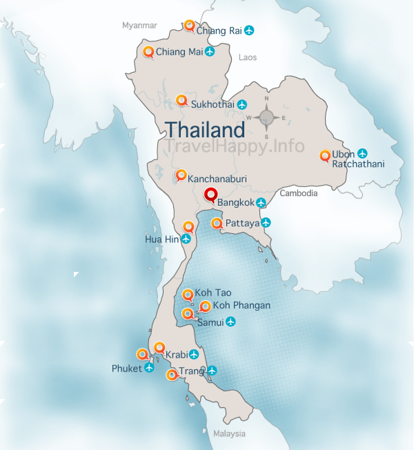 Nearby: Phuket and Krabi are a short distance from Koh Yao. One of southern Thailand’s most lavish resorts, Six Senses Yao Noi is a beautiful resort with incredible views across Phang Nga Bay. Accommodation ranges from garden villas to private pool villas, with a luxurious spa and in-house dining making Six Senses a great place to relax. Villaguna Residence & Hotel is a mid-range resort on Koh Yao Noi with great views over Phang Nga Bay and a large selection of suites and pool villas. The hotel has direct access to the beach and an isolated location that makes it great for romantic holidays. Simple and inexpensive, Sabai Corner Bungalows is one of just a few budget accommodation options on Koh Yao. The bungalows are extremely simple but offer great access to the beach, making them a convenient option for backpackers that want to enjoy Koh Yao. One of Thailand’s most famous islands, Koh Samui is the gateway to the Samui Archipelago and a major destination in its own right. Stunning beaches, a wide range of activities and easy access by air from Bangkok make Koh Samui one of Thailand’s best all-round destinations. 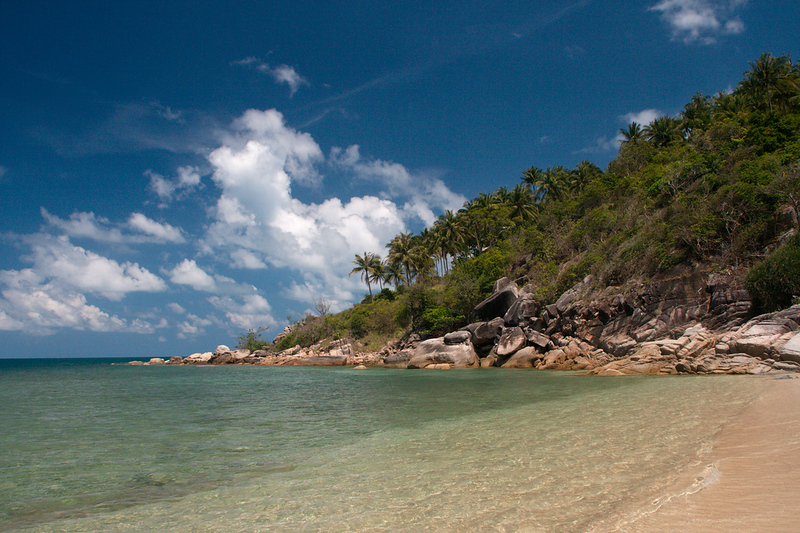 Like Phuket, many of Koh Samui’s beaches are heavily developed and very popular. Head to the south of the island, however, and you’ll find a great selection of quiet beaches that haven’t yet been discovered by the large crowds of package tourists in Chaweng and Bophut. As well as its great beaches, Koh Samui has a huge range of attractions for people of all ages, from elephant trekking to snorkelling, diving and more. Add a huge range of hotels into the mix and it becomes clear why Koh Samui is such a popular destination. Recommended for: Solo travellers, couples and families. Stay for: Three to four nights to one week. Nearby: Koh Phangan and Koh Tao are both accessible by ferry from Koh Samui. Located close to Bo Phut in the north of Koh Samui, Hansar Samui Resort is an opulent resort located on a hill overlooking the beach. The hotel’s swimming pool and guest rooms have great views over the water and local landscape. Montra Hotel is a four-star resort hotel on Lamai Beach — Chaweng’s quieter, more bohemian neighbour. With a selection of guest rooms and villas and a large lap pool, Monta offers clean and comfortable accommodation on one of Koh Samui’s most popular beaches. Located close to Bophut Beach and the area’s bohemian Fisherman’s Village, Pelegrin Hotel Samui is a cheap and simple boutique hotel with just eight rooms. The hotel’s location and low prices make it a good choice for backpackers that want to be close to the beach. Better known for its monthly Full Moon Party than its beaches, Koh Phangan has a reputation as one of Thailand’s top party destinations. While this certainly isn’t untrue, Koh Phangan is also an excellent island for relaxing and enjoying the natural beauty that Thailand is famous for. Easily reachable from Koh Samui, Koh Phangan has a great mix of cheap accommodation for backpackers and an increasing number of upmarket resorts. 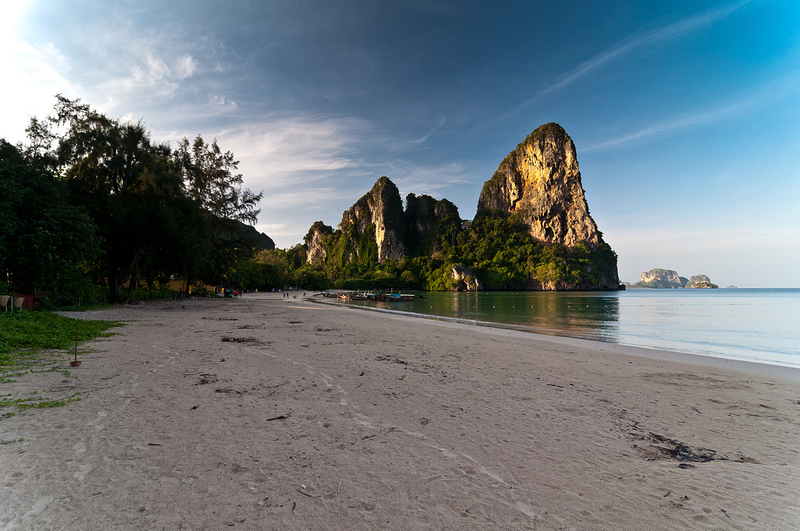 Many of the island’s most isolated beaches are among the quietest in the Gulf of Thailand. The monthly Full Moon Party (and numerous other Half/Black Moon Events) draw large crowds to Koh Phangan’s Haad Rin Beach, but most people leave shortly after the events, making this island a surprisingly good choice for romantic trips and family holidays. Recommended for: Solo travellers, backpackers. Nearby: Koh Samui and Koh Tao are both accessible from Koh Phangan by ferry. Great sea views and luxurious rooms make Anantara Rasananda Koh Phangan a good choice for couples. Fantastic service and easy access to the beach make this a good choice for getting away from the noise of Haad Rin and other popular beaches. Moonstone Studio is a mid-range resort located close to Haad Rin, Koh Phangan’s party capital and one of the island’s most popular beaches. Surrounded by jungle and palm trees, Moonstone is a good accommodation option that’s quiet despite its location close to the Haad Rin area. Another Haad Rin hotel, Thai Dee Garden Resort is a low-cost backpacker resort with a range of cheap and simple bungalows. 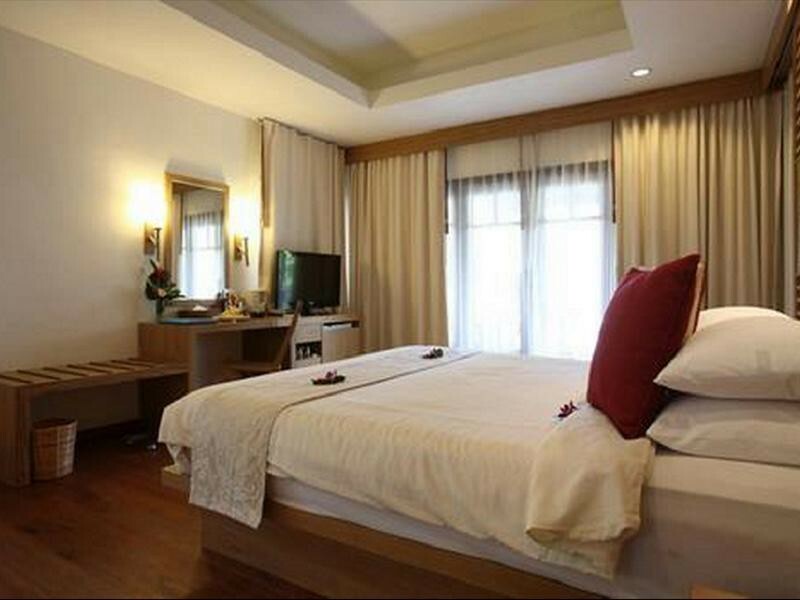 Despite the resort’s modest pricing, its rooms are maintained to a high standard and have free Wi-Fi. Koh Tao is a small island located north of Koh Phangan. Accessible by ferry from Koh Phangan or Chumphon, Koh Tao is famous for its diving, with impressive coral reefs within easy reach of many of its beaches. Smaller than Koh Samui and Koh Phangan, Koh Tao has long been a favourite destination of backpackers and divers. In recent years, upmarket resorts have popped up some of its quieter beaches, broadening the island’s appeal to couples and families. The majority of Koh Tao’s resorts, restaurants and nightlife can be found on the western coast of the island. Travel to the quieter, less developed eastern coast and you’ll find a great range of quiet, secluded beaches with few other people around. Recommended for: Solo travellers and backpackers. Visit for: Three to four nights. Nearby: Koh Samui and Koh Phangan are both accessible by ferry from Koh Tao. Jamahkiri Spa and Resort is an upmarket resort hotel on Thian Og Bay in Koh Tao’s southern coast. Quiet and isolated, Jamahkiri is a great escape from the nightlife and backpacker hostels of Sairee Beach and Maehaad. Located close to Sairee Beach, Thalassa Hotel is a mid-range hotel aimed at people that want to stay close to Koh Tao’s nightlife. 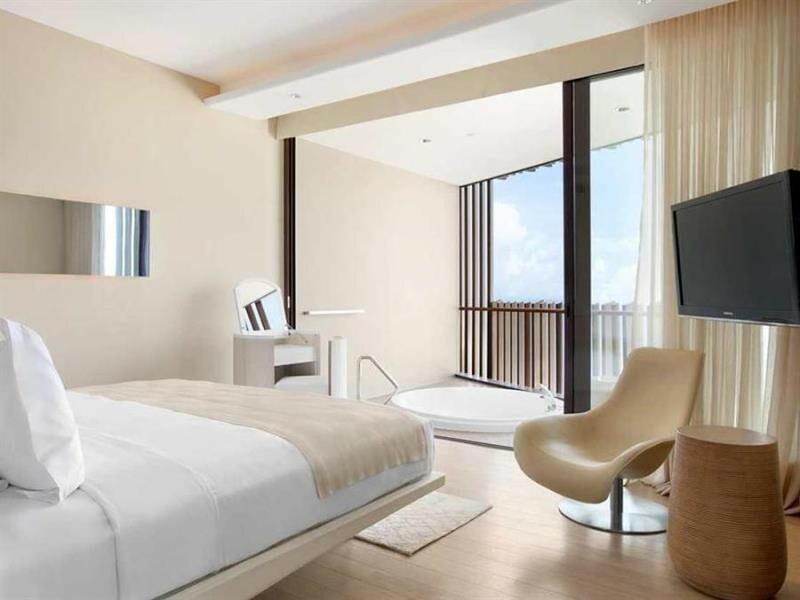 Clean and modern, the hotel has 20 rooms, all of which are equipped with free Wi-Fi. Although it’s a reasonable walk to the beach, Chaantalay Hotel is one of the best budget hotel options near Sairee Beach. Clean and modern, this small boutique hotel with just nine rooms is close to local restaurants and bars. Krabi’s most popular beach resort town, Ao Nang is a busy town with several beaches and a great selection of activities for visitors. As the tourist hub of Krabi Province, Ao Nang is a good base for exploring Krabi. Ao Nang’s two beaches are picturesque but not as impressive as those found in nearby Railay or on islands such as Koh Phi Phi. Frequently longtail boats connect Ao Nang with Railay and make it easy and inexpensive to travel between the two beaches. Thanks to its diverse selection of hotels and restaurants, Ao Nang is a good destination for a wide variety of travellers. Luxury resorts, mid-range hotels and cheap backpacker guesthouses are all easy to find here, whereas supply is often limited on nearby Railay Beach. Recommended for: Families, solo travellers. Nearby: Phuket and Koh Phi Phi are a short ferry trip from Krabi Province. Railay Beach is a short longtail boat trip away. A 30 minute drive from Ao Nang itself, Phulay Bay is an ultra-luxury resort offering private pool villas for guests. The resort’s grounds are located right on the beach, making it a great choice for couples that don’t want to travel far. Aonang Phu Petra Resort is a four-star villa resort located a short drive from Ao Nang’s main beaches. Although it’s not as close to the beach as other hotels in the area, Aonang Phu Petra offers fantastic views of Krabi’s famous limestone karsts. A cheap backpacker hostel located within walking distance of the beach, I Krabi Hostel Aonang is a good value accommodation option for people that don’t mind sacrificing luxuries for a great location. Travel Time: One hour from Bangkok by air, followed by a 30 minute taxi trip and 15 minute longtail boat transfer. Famous for its towering limestone cliffs, Railay Beach is isolated from the rest of Krabi Province by dense jungle and hills. Longtail boats arrive on Railay West frequently, bringing in groups of people from nearby Ao Nang. 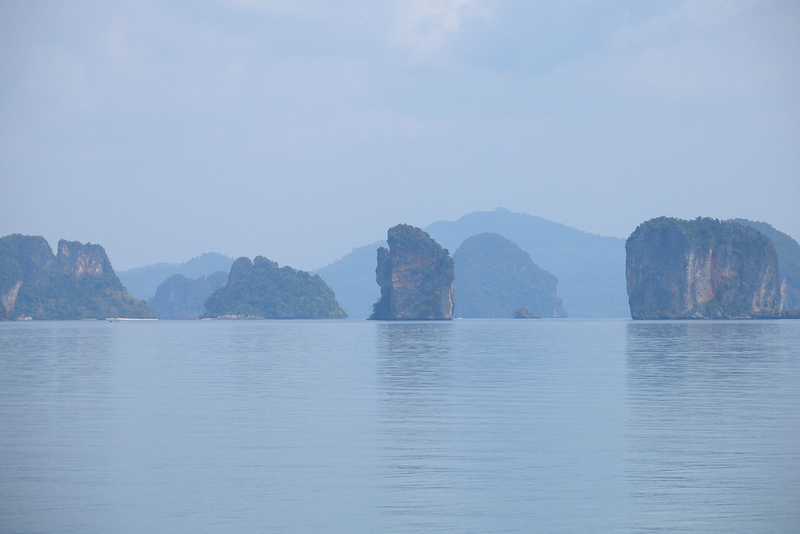 Thanks to its isolated location, Railay feels more like an island than a peninsula. Railay itself is split into two separate beaches: the more picturesque Railay West, which is dotted with resorts, and the swampy, inexpensive Railay East. Undeniably beautiful, Railay is a great place to relax and enjoy Thailand’s natural beauty after visiting dense, urbanised Bangkok. It’s also paradise on earth for rock climbers, with some of Thailand’s best climbing in nearby Ton Sai. Nearby: Ao Nang is a short longtail boat ride from Railay Beach. Railay Bay Resort & Spa is an upmarket resort on Railay West. One of the largest resorts on the beach, Railay Bay Resort & Spa has a wide range of rooms and cottages available, from simple deluxe rooms to spacious pool villas. Railay Princess Resort & Spa is a modern four-star resort on Railay East. A short walk from the bars and restaurants on Railay East and just five minutes from Railay West, Railay Princess is a good choice for travellers that don’t mind a short walk to the beach. With just 19 bungalows, Railay Garden View Resort is a small resort on Railay East with cheap and simple accommodation. With a remote location at the end of the beach, Railay Garden View is a quieter option than other budget resorts in the area. Quiet and relaxing, Koh Jum is a small island located between Koh Lanta and Krabi. Perfect for rest and relaxation, Koh Jum’s untouched beaches and small resort hotels make it a great place to see Thailand’s natural beauty without mass development. Koh Jum’s accommodation ranges from simple beach bungalows to modern resorts. Since the island isn’t a popular destination for mass tourism, there’s very little in the way of infrastructure or nightlife — you’ll even need to pack cash for your entire stay as the island has no ATMs. Nearby: Krabi, Phuket and Koh Lanta are a short ferry trip from Koh Jum. Koh Jum Beach Villas is a stunning five-star resort on an island better known for its expansive, undeveloped beaches than its luxury accommodation. A selection of private pool villas, ranging from one bedroom to three, are available for guests. With 20 bamboo cottages and villas just minutes from the beach, Koh Jum Resort is a fantastic mid-range accommodation option. The resort has a small swimming pool overlooking the ocean and free Wi-Fi in all rooms. Peace Paradise Resort is a bungalow resort on Koh Jum that offers peace and tranquility. The eight bungalows available certainly aren’t luxurious, but they’re clean and comfortable enough for an enjoyable stay with great access to the beach.